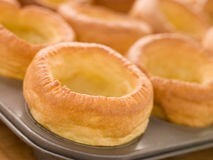 Yorkshire Puddings are a lovely accompaniment to a roast dinner. They’re super easy to make too. Heat oven to 230C/fan 210C/gas 8. Drizzle a little oil/dripping evenly into a 12-hole non-stick muffin tin and place in the oven so the pan is sizzling hot when you pour in your batter. To make the batter, tip plain flour into a bowl, season with salt and pepper, then make a well, and beat in four eggs until smooth. Gradually add 200ml milk and carry on mixing gently until the mix is completely lump-free. Aerate the mixture by pouring from jug to jug a few times. Remove tin from the oven. Carefully and evenly pour the batter into the holes. Place the tin back in the oven and leave undisturbed for 20 mins until the puddings have puffed up and browned. Serve immediately or freeze up to 1 month. Pasture Fed Pork is delicious.